Economy • But Black Diamond president says the outdoor industry supports 6.5 million U.S. jobs. Thomas Burr | The Salt Lake Tribune Utah Gov. 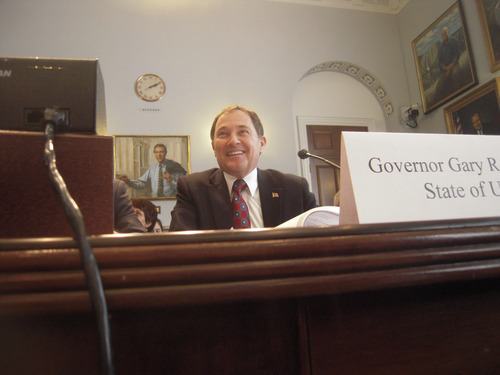 Gary Herbert tells before the House Natural Resources Committee on Tuesday that a new Interior Department policy would cost Utah billions of dollars and hinder its economy. Washington • Gov. Gary Herbert warned Congress on Tuesday that a new Interior Department policy creating protected "wild lands" could cost Utah billions and weaken his state's economy. Herbert, testifying before the House Natural Resources Committee, criticized the recent directive that allows land managers to seek out and protect public lands with wilderness characteristics, calling it a "grave error" with lasting consequences. "This body and your colleagues ought to be just as offended as the people of Utah are by this order," Herbert said. "By bureaucratic fiat, one branch of the government has overstepped and overreached and has devalued the rights of the states and [their] citizens." Herbert said it would be "safe to say" the long-term effect of the policy could cost billions to Utah's Permanent School Fund, which receives money from mineral development on trust lands set aside for that purpose. The School and Institutional Trust Lands Administration reported in 2008 that it deposited $106 million into the school trust fund from activities on its lands, with about $27 million of that money actually flowing to schools from dividends and interest from that fund in the 2007-2008 school year. Herbert clarified after his testimony that the loss he is estimating includes a decrease in investment by oil and gas producers in local economies and equipment and not just to the school trust lands. "This does not help my economy one bit," the governor said. Herbert's testimony mirrored that of most of the witnesses invited by the Republican-controlled committee, whose chairman, Rep. Doc Hastings, R-Wash., promised many more hearings on the new wild lands policy. Interior's order essentially sets aside an agreement between Utah and the federal agency that took away any authority of the Bureau of Land Management to designate wilderness. The new policy says the BLM can inventory lands for wilderness qualities and then seek, through a public process, protection for those areas. "This order is a clear attempt," Hastings said, "to allow the administration to create de facto wilderness areas without congressional approval." Mike McKee, a commissioner from eastern Utah's Uintah County, which has seen the boom and bust of oil and gas production, said his community is suffering from Interior's policies. "In addition to being poor policy," McKee said, "the wild lands policy is illegal." BLM Director Bob Abbey stressed that the new policy has two steps, finding and then seeking protective status for public lands and that no action would happen without public input. Abbey also noted that his agency just last week approved a lease for potash production in Utah, which could create 300 jobs. Peter Metcalf, president and co-founder of outdoor-gear maker Black Diamond, said protecting public lands yields many jobs. He noted the outdoor industry contributes $730 billion to the U.S. economy and supports 6.5 million jobs. "This ain't pocket change," Metcalf said.